FERNDALE, Mich. — “Women are the realistic people in the world; they can see the future and the need for peace and stability,” said Kerstin Greback, co-president of the Women’s International League for Peace and Freedom (WILPF). Greback, who is from Sweden, is touring the U.S. to speak on the links between gender equality, peace and security, and, she said, to “get a feel” for this nation’s people, mood, and thinking. 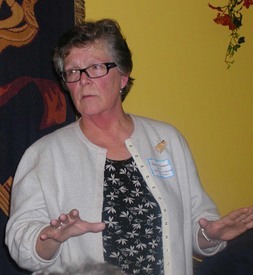 Addressing a luncheon crowd here March 18, Greback said women play a key role in the fight for peace. Preventing war also requires the “protection of women’s rights and the maximizing of women’s political power,” she noted. People everywhere have concerns about security, but “we need real, not fake, security,” Greback said. The walls the U.S. is building along the Mexican border and those Israel is putting up to prevent movement of Palestinians are not the answer, she said. A goal of WILPF, Greback said, is to reach out to the underdeveloped world, to insure women have a voice and to help women organize themselves to play a role in the redevelopment of their country. She said United Nations Resolution 1325 can be a tool to reach this goal. Resolution 1325, adopted in 2000 by the UN Security Council, calls for better protection of women’s interests in post-conflict situations and for their full inclusion in reconstruction efforts that lay the foundation for sustainable peace and prevention of future conflicts. A second area of concern for Greback’s organization is the military buildup in the European Union. From the Balkans to Poland, new members of the EU are being forced to bring their military up to NATO standards. And who is put forward as the straw enemy, she asked, and then answered: immigrants from Africa and other areas coming to find work. A variety of economic and political factors force people to migrate, she noted. The idea is projected that Europe is somehow entitled to the oil under North Africa’s sand, Greback said, while the conditions of the people there are of no importance. The immigration question and NATO military buildup are big issues for the European peace movement according to Greback. She added that Romania has a large number of unemployed people but its admittance into the EU came with a price and part of that price will be paying to beef up its military rather than address its social and economic problems. “A small battleship costs the equivalent of six and a half years of educating Afghanistan’s children,” she pointed out.